Cranberry Jalapeno Jam is made from of spicy jalapeno and cranberry. 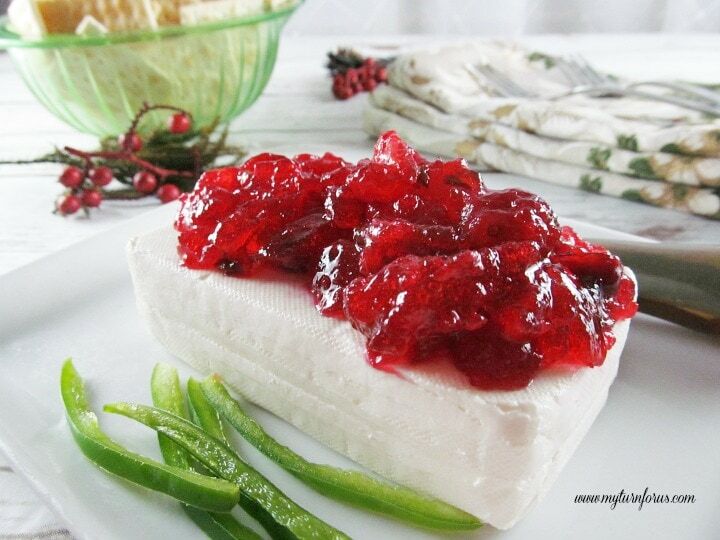 This Cranberry Jalapeno jelly cream cheese appetizer is served during the holidays. 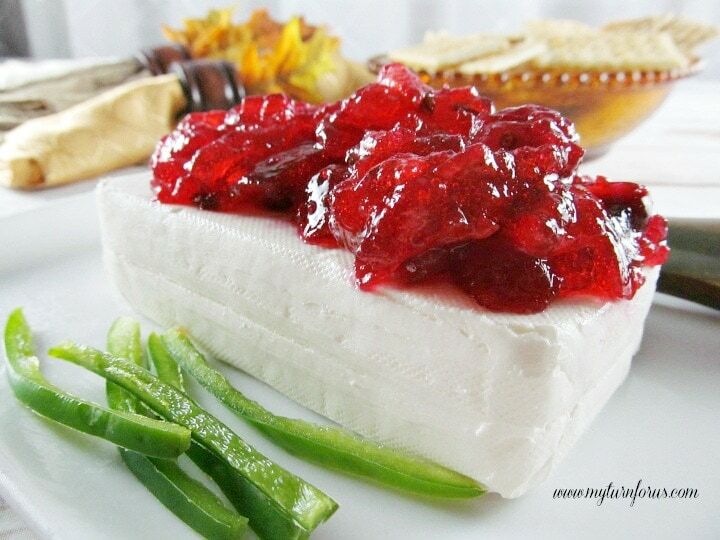 If you are looking for a simple way to entertain this year, serve this Cranberry Jalapeno Jam over cream cheese alongside gourmet crackers for holiday parties. These jars of jam are made ahead of time and kept in your pantry for a quick appetizer. We don’t know about you but the holidays are a rushed time of the year for us, we are caught up in a whirlwind of attending and hosting parties, having friends drop over and enjoying family dinners. It’s also the time of the year when it’s so important to make moments into special memories and to make each event special, but these goals come with a price such as stress. 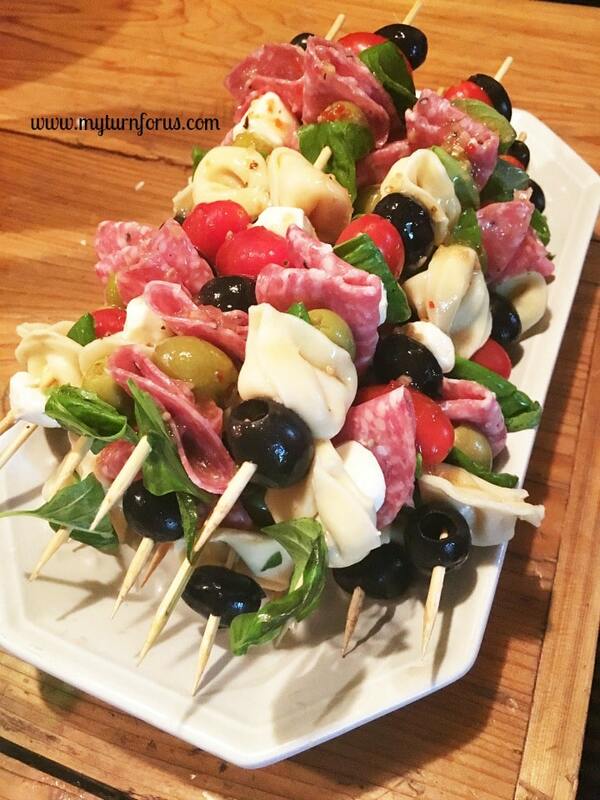 We do have a little solution for you today that should help relieve some of that pressure and hopefully take away a great part of the stress when you might need a quick appetizer or a dish to take to a family dinner. 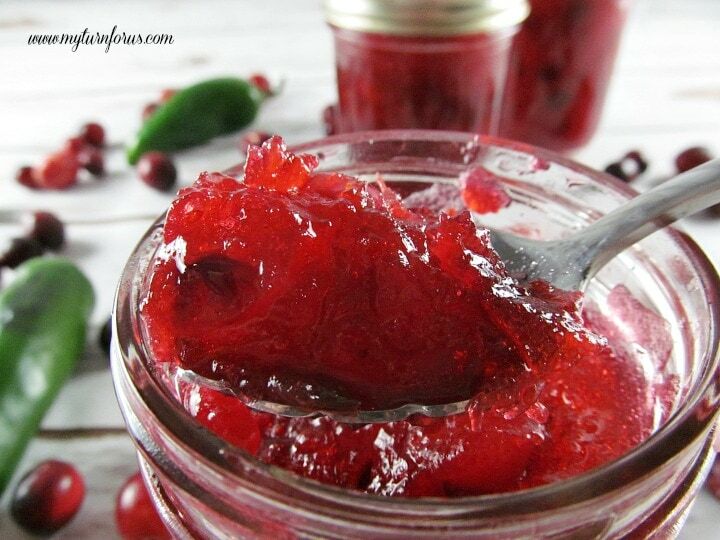 This gorgeous cranberry jalapeño jam can be stored in your pantry ready to be opened. Then served over a block of cream cheese to make the best jalapeno jelly cream cheese appetizer. This Cranberry Jalapeno Jam recipe makes 4 jelly jars (1/2 pints) of spicy jalapeno jam. It should get you through the holidays in style since each jar is enough to make two Jalapeno jelly cream cheese appetizer plates. 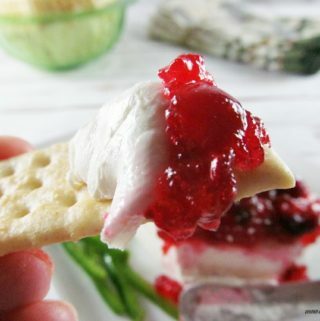 Just keep a few blocks of cream cheese in the fridge and then you will always be ready with an impressive appetizer for drinks with friends, or a great addition for a potluck party or just watching holiday movies with the family. If you have never made jam, no stress there either, I promise, “pinky promise”. 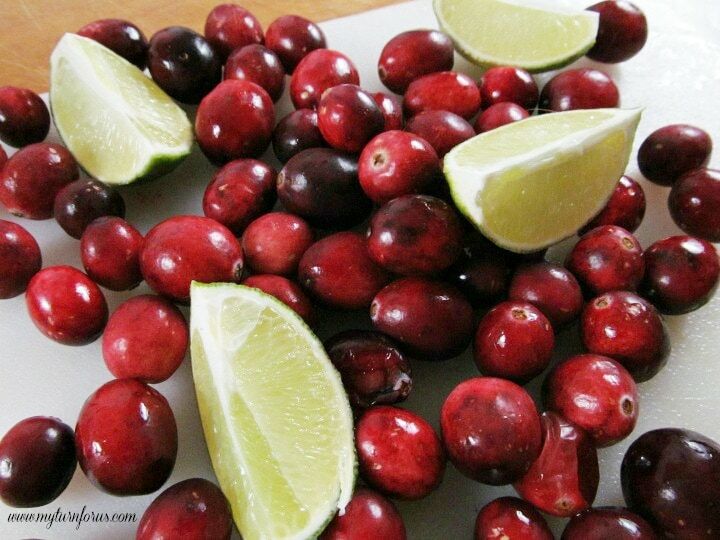 The whole secret is grabbing a box of pectin (Sure Jell) when you are picking up your cranberries, jalapeños, and limes. Then just follow a few simple steps and you will have jam in no time! 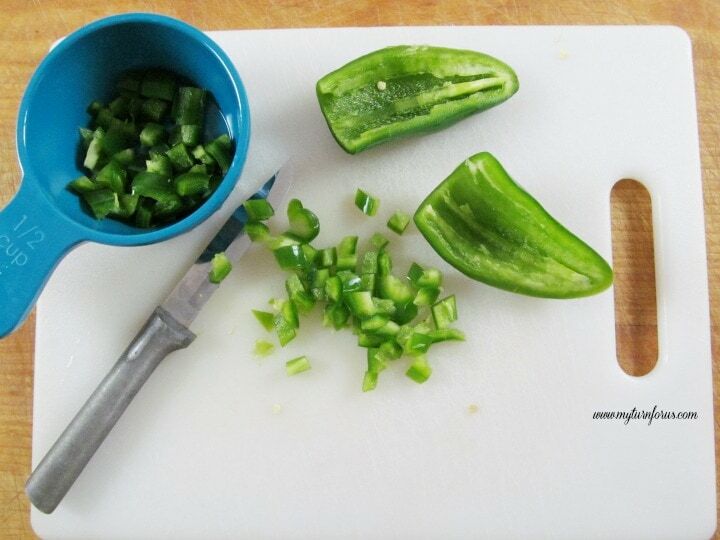 Not much chopping going on either, just the jalapeños. 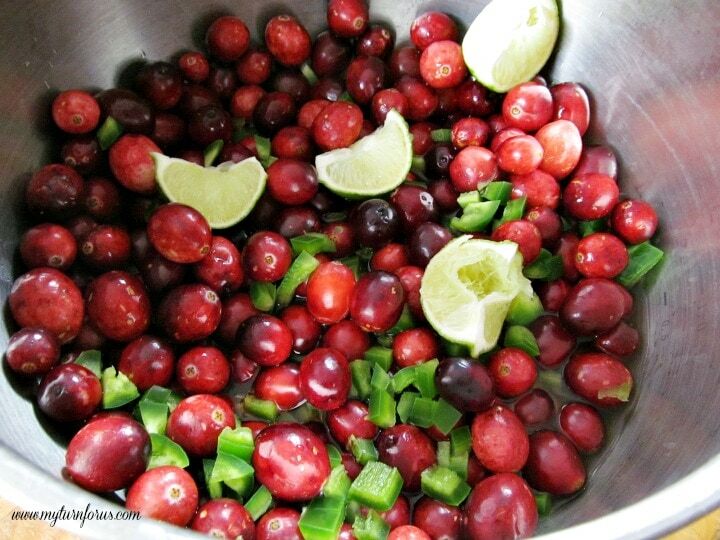 Cranberries are left whole and thrown into a pot along with the chopped jalapeños and limes and boiled in apple cider vinegar and water. 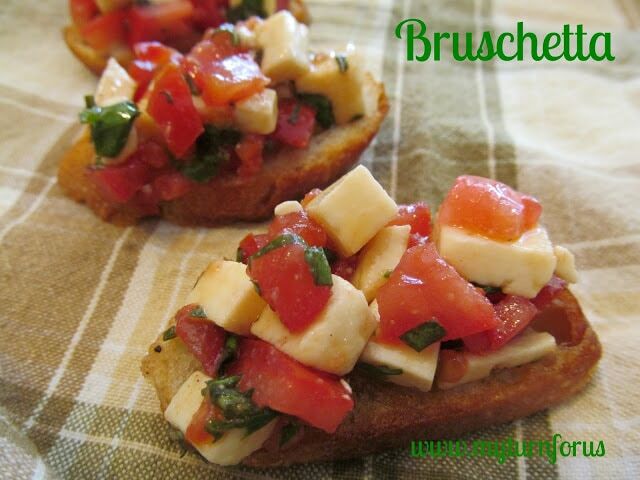 After a few more steps, a great appetizer will appear! Ok, it will not magically appear but with these few additional steps, your family and guests will believe it did. This Cranberry Jalapeno Jam recipe makes four jelly jars (1/2 pints) of spicy jalapeno jam. So prepare 4 1/2 pint jelly jars by placing them in boiling water and allow to simmer while making the jam. 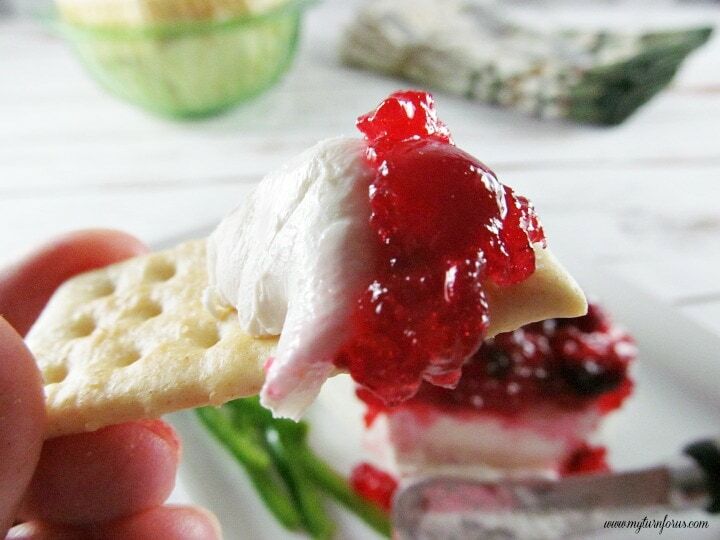 To Serve, spoon contents of jars over an 8oz block of cream cheese and serve with gourmet crackers. I made it. I followed the directions exactly. My daughter (a chef) said it was pretty vinegary, but hoped that taste would go away after a while. I am not a fan of vague measurements – my lime was super juicy I would have preferred a set amount. That being said, it is a complex jam. You have the bitterness of the berries, the heat of the peppers and the lime. Some folks might want more sugar. 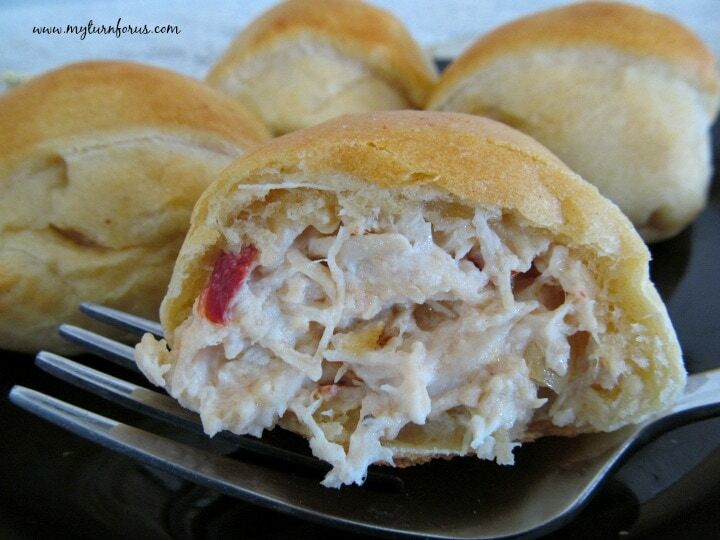 I was pretty excited to try this recipe as it is just so different and so easy! As the author stated, this is something you bring out at the holidays. I love trying new things and am so glad I tried it. I liked it, but I didn't try it with the cheese (just off the spoon). Thanks for sharing. I would enjoy making this again! It would be great on a turkey burger! Did you use liquid or powdered pectin? I used powdered Pectin, I will be updating and making it more clear in the recipe. Thanks so much for asking this question and bringing it to my attention. Can you use low sugar Sure-Jel pectin? And I wanted to maybe double recipe? I’m sorry but I have never used low sugar sure Jel pectin so I really don’t know. Usually, it’s best to repeat the recipe vs doubling it. To be safe I would prob make two batches. Thanks so much for your interest. Maybe I missed it… how many jars do I need to have on standby? I’m sorry, you are right, the number of jars needed was hidden in the long narrative. You will need 4 jelly jars (1/2 pints) for this recipe. Thank you for bringing this to our attention, we will be updating the recipe card to reflect this. Better without the pectin, still sets up. That’s good to know. Thanks and glad you enjoyed it.